This is the D page of our A to Z guide to plants -- how to care for them, landscaping with them, and cooking and healing with them. 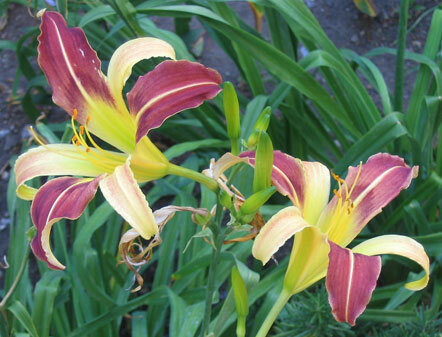 These are delightful plants that will bloom all summer giving bright color to a border garden. Benefits: Dried Chrysanthemum flowers have been a potent force in Chinese medicine. So much so that it is recommended as a once daily tea. Do discuss this with your physician before giving this tea a try. 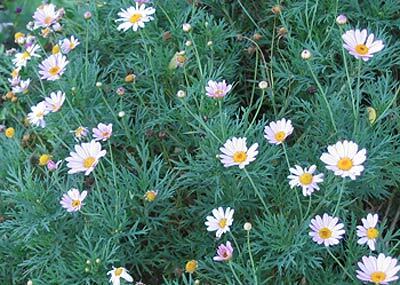 Planting and Care: Grow the annual called painted daisies in fertile, well-drained, moist but not wet soil in full sun. Probably in hot climates, it would work better to have them enjoy morning sun, but not the hot afternoon sun and heat. 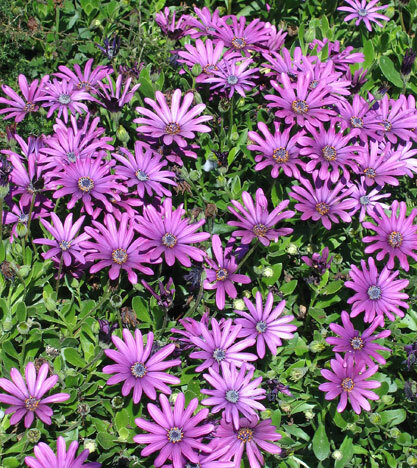 Benefits: These easy to care for daisies will attract bees, birds, and butterflies. From: The state of California in the USA. 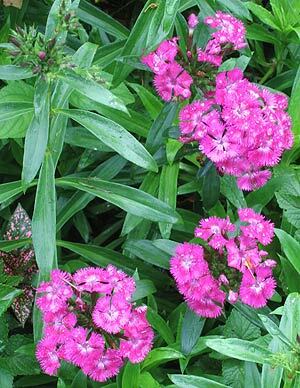 Planting and Care: These wonderful 2 to 3 foot tall perennials grow more or less in clumps. They like fertile soil and appreciate good drainage. 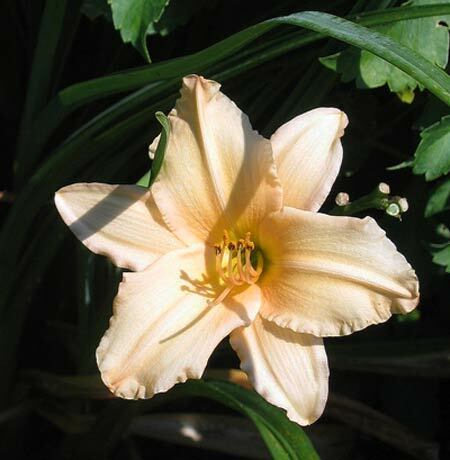 They will grow well in bright shade or full sun. 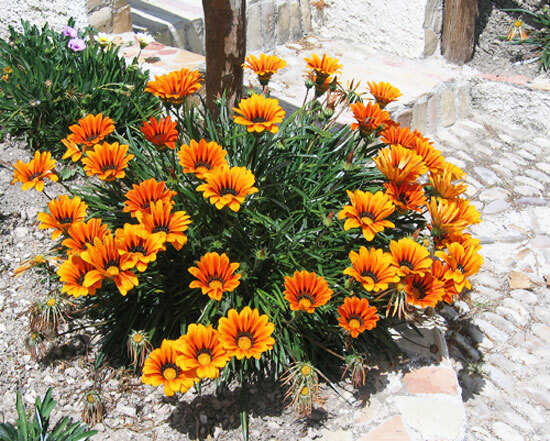 Shastas are considered perennial, but they come back for only a few years so it is wise to plant some every year to be sure. 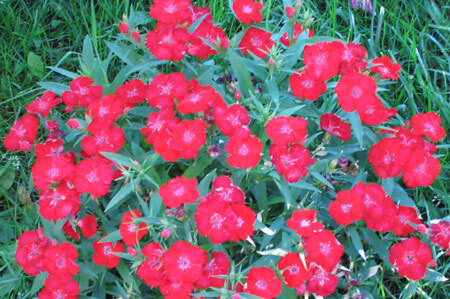 Benefits: This is an easy to care for plant that will attract birds to your garden. Planting and Care: This is a warm climate 1 to 3 feet tall annual daisy liking it sunny. 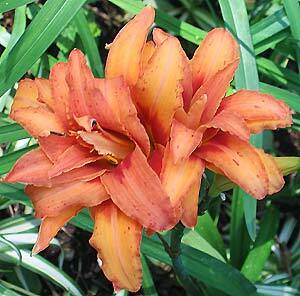 It also likes a rich well draining soil, but does pretty well in poor soils as well. When well cared for they will bloom all summer in cooler climates, but they won't make it through winter. Benefit: The seed cases of this plant are used in extracting pyrethrins a natural insecticide which is very effective in killing insects and in controlling mosquitos. 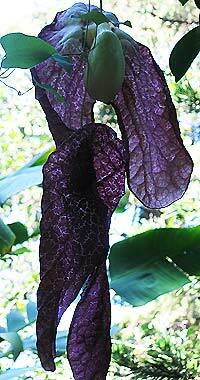 Though it is a poison, it decomposes quickly when exposed to direct sun. 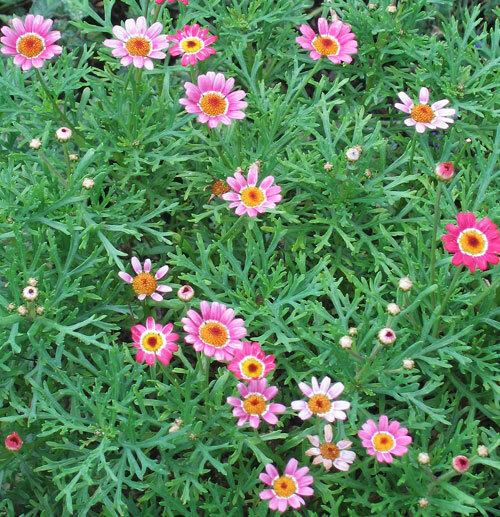 Planting and Care: The Dalmatian chrysanthemum closely resembles a daisy. 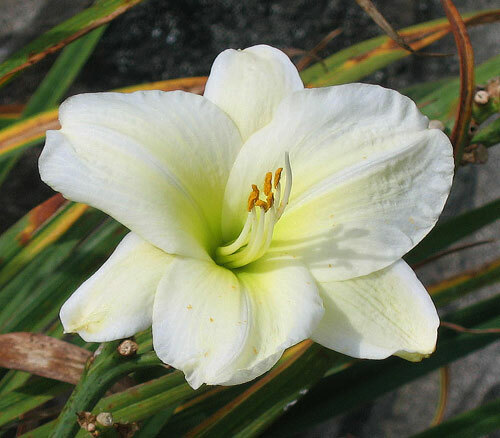 It has white flower petals with a yellow center and will grow to as much as 3 feet in height, though usually less. 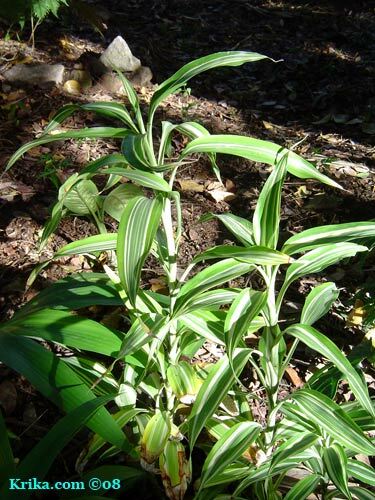 It has stiff stems and grayish green foliage. These are the pretty, but dreaded, lawn weeds that are an excuse for using terribly toxic weed killers. On the plus side, the entire plant is edible and packs powerful health improving benefits. Try it in salads or cooked with other greens. Benefits: In more earth friendly places, dandelions are used as medicinal plants to lower blood pressure and to improve the look of your skin. Photographed: I haven't yet taken one, but I'll try this summer. Planting and Care: Look around your neighborhood. When you see one of those lovely balls of seeds on a stem. Pick one and blow it where you would most like to see these delightful yellow flowering weeds. Water your grass normally and soon you'll have a fine crop of dandelions. 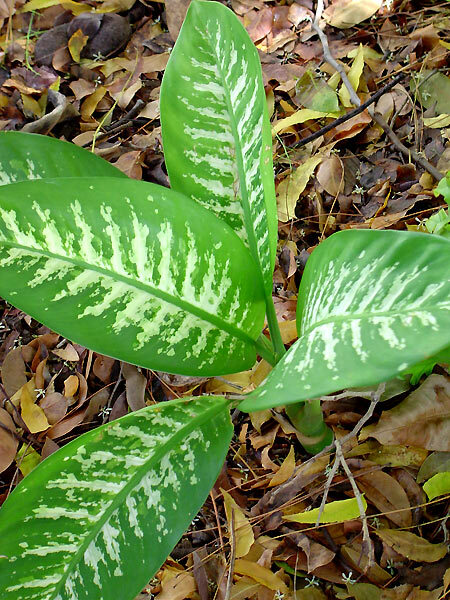 Loving water and growing well in full sun or semi shade, dasheen leaves are related to the elephant ear, but is tougher in dealing with the Caribbean sun. It is the above ground edible part of the plant. 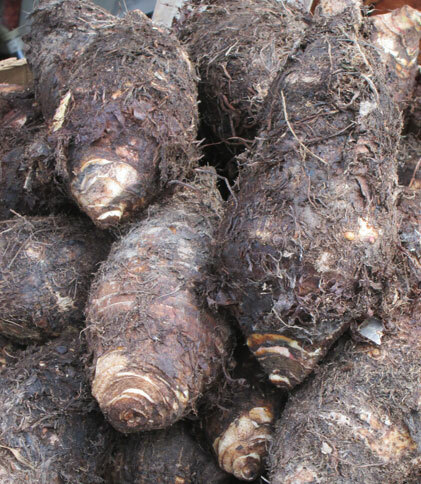 Below ground is an edible corm called taro. Benefits: Both the corm and leaves have nutritional value. The corm provides a smooth nutty and sweet food that babies like very much while the leaves provide protein and vitamins A and C.
Photographed: In the market in Scarborough, Tobago, in 2018. 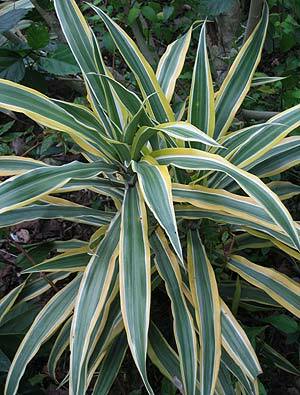 Planting and Care: This plant does well in fertile deep marshy soil and will even grow with its base in flowing water. 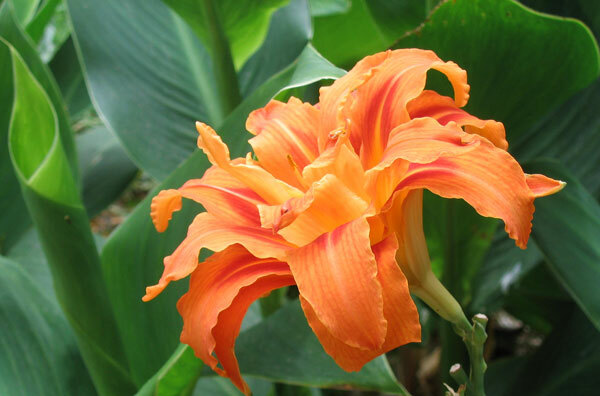 It lives best in full sun with frequent rainfall to maintain proper soil conditions and humidity in the air. Uncooked this plant is toxic, but it is rendered safe with adequate cooking. 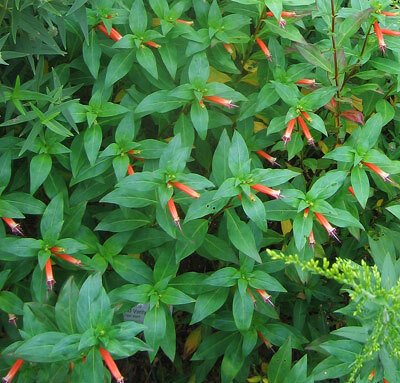 Benefits: This terribly named plant is a hummingbird and butterfly attractant. 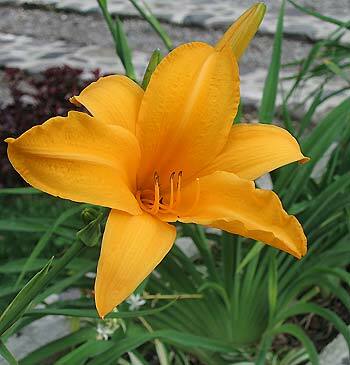 Planting and Care: Give this sweet little perennial plant full or partial sun and routine rainfall or watering and you'll have its pretty flowers to enjoy for months each year. The best part is the plant itself takes care of expiring flowers so you don't have to remove them yourself. When mature it will reach a height of 1.5 to 2.5 feet and it will spread about the same amount. Photographed: In our garden at Lake Atitlan in Guatemala. This photograph was an accident and I am ever grateful when I make these "mistakes." This large family of wonderful flowering perennials prefers a little shade from the hot mid-day sun in warm climate places. Up north all day sunshine is fine. 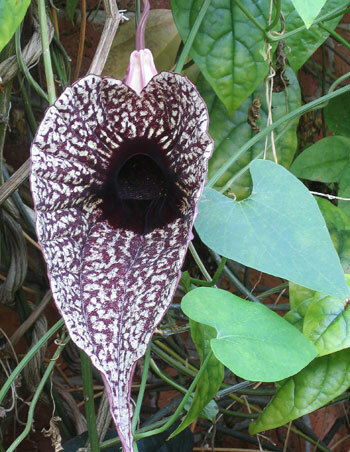 Benefits: Apparently all parts of the plant are edible, though the flower is most likely to find itself in the cook pot. Planting and Care: In most places, full sun and routine rainfall or watering will keep these plants thriving and in bloom. 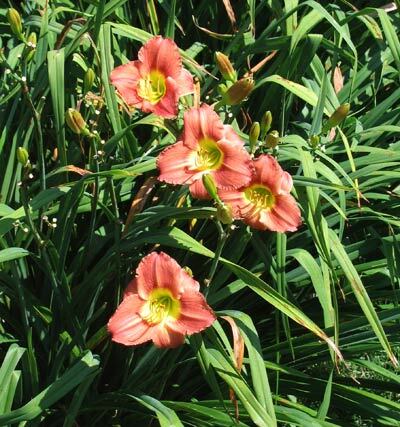 Once well established, they are even a bit tolerant of drought and high heat although it will probably lessen the number of blooms on each plant. 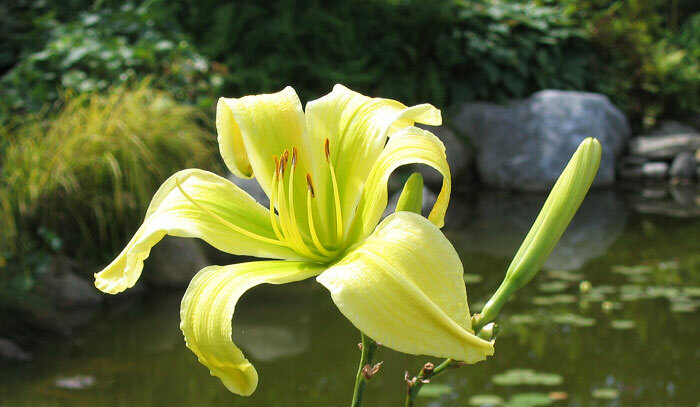 "Daylily is the common name for blooming plants which belong to the genus Hemerocallis. The flowers of the plant are diverse in color and form, due to continuous efforts by gardening enthusiasts and horticulturalists to create new hybridized forms." Contributed by Sharon from Denver, Colorado. 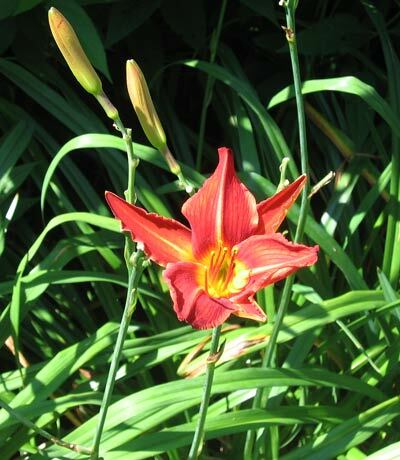 With my appreciation, this daylily was identified by a new visitor to the site, Sharon from Denver, Colorado. 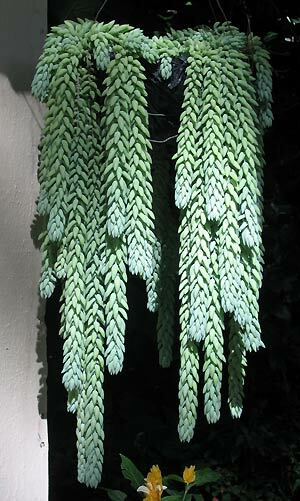 Photographed: In the Hotel Regis garden at Lake Atitlan in Guatemala, 2012. Photographed: In Bar Harbor, Maine, in the summer of 2013. 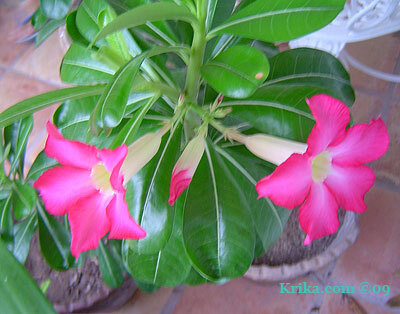 In appearance the desert rose seems to be a member of the frangipani family. Benefits: It is said by some to have medicinal benefits though I have not found specific directions on how it should be used. Photographed: On the tiled entryway to our former home in Montserrat and below in our deck garden. Planting and Care: Plant it in the sun and keep this plant relatively dry or the results will be very disappointing. When well cared for it will grow to be about five feet tall with its branches spreading to be about four feet wide. 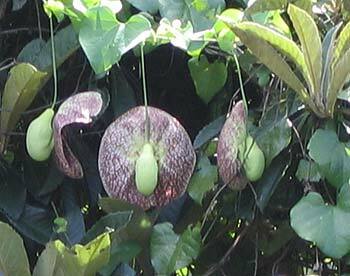 Warning: This plant is poisonous and its sap was actually used in hunting game in Africa. To me, these have always been tiny carnations. 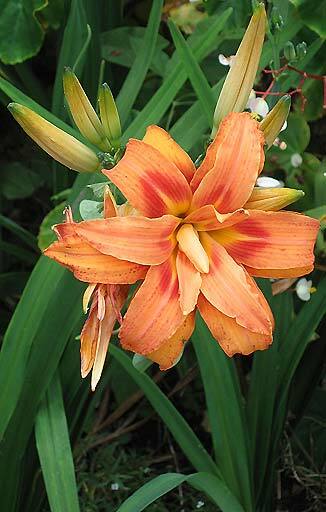 They were in my garden as a young child and each year I looked forward with joy when they began blooming. I think we called them "pinks" at the time. 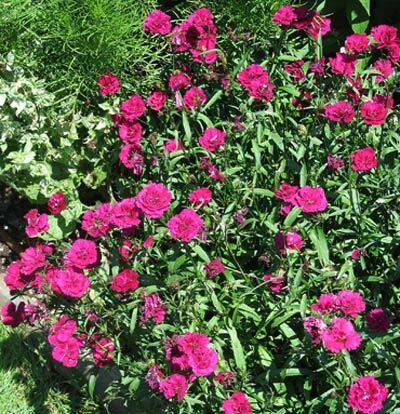 Benefits: Dianthus are said to have many curative qualities. From: From Europe and Asia generally but there are also family members native to north Africa. Photographed: In Ushuaia, Patagonia, Argentina, in the Botanical Garden at the Hotel Atitlan on Lake Atitlan in Guatemala and at the bottom in the Thuya Garden on Mt. Desert Island, Maine 2013. Planting and Care: These are extremely easy to grow perennials. Get little plants at your local garden shop in the spring. Pick a place in the sun in your garden if you are in a northern climate and one with mid-day shade if you are in a hot climate and set them in. Give them routine watering or rainfall to keep them happy. 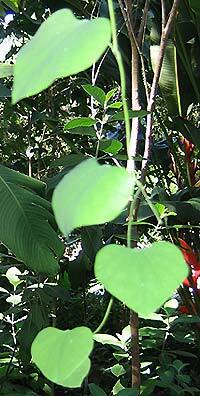 This is another one of the many poisonous plants common in the Caribbean. We have three of them growing in our shady terraced garden. Benefits: None that I have found so far. 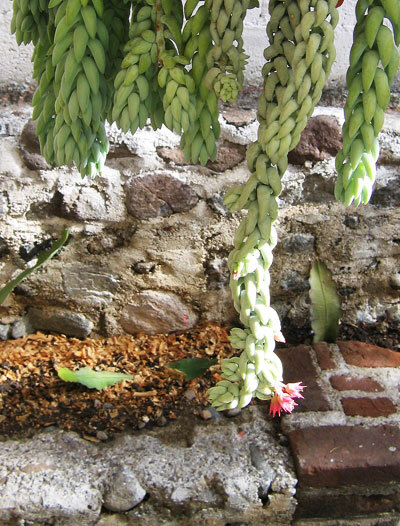 Photographed: On the left in our terrace garden at our former home in Montserrat and on the right in the Botanical Garden at the Hotel Atitlan in Guatemala. 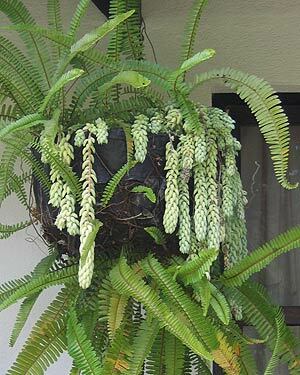 Planting and Care: Dieffenbachias are popular house plants in northern climates especially in public buildings as they tolerate low light very well and require little care. Planted in a tropical setting keep them out of the mid day sun. 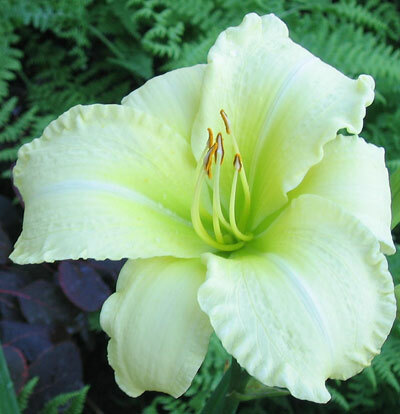 They will do best in a bright shady area where they will receive routine rainfall or watering. I should say it was a treat to have former house plants growing happily outside in my garden. 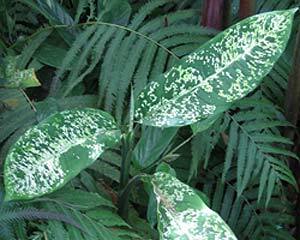 Warning: Dieffenbachia is poisonous to humans and animals if ingested. 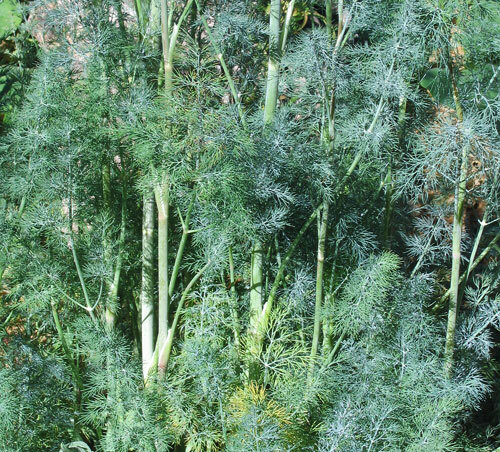 Dill is an annual herb, a member of the carrot family, which needs to be refreshed in the garden more than many of our old standbys. 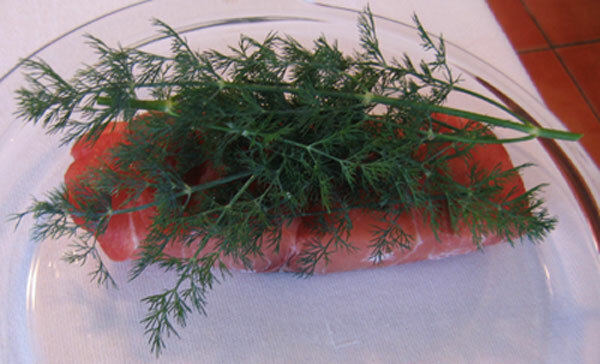 Fresh dill is used in making dill and kosher dill pickles and in flavoring salads and more. Walk through your garden brushing your dill plants with your hand as you pass and simply refresh yourself with the aroma. Benefits: Dill is said to be helpful in reducing your heart rate and I have personally found this to be true. Talk with your physician before depending on dill to help you. Don't count on the dill in pickles to help because salt used in the pickling process will undue the help. Use dill as a flavoring in other foods as in the recipe below. From: The Mediterranean region and southern Russia. Photographed: In our latest garden at Lake Atitlan in Guatemala. Planting and Care: Dill does not transplant well so seeds should be planted where the plants will grow. 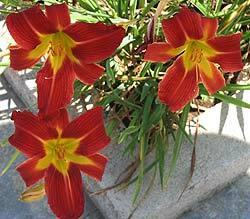 They will eventually be about three feet tall or more so keep that in mind when selecting a place to plant them. 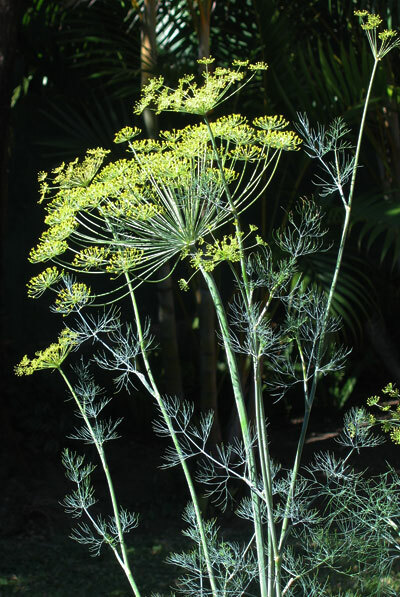 Dill prefers to grow in a place with full sun and a well drained ordinary soil. 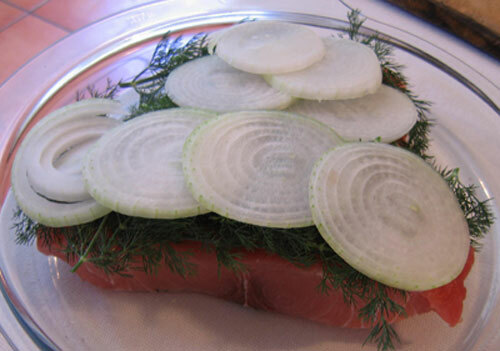 Heat the oven to 350° F. while you butter the glass casserole, arrange the fish and dill, slice and arrange the onion, grate the pepper over the onions and slice the remaining butter on top. Cover with a glass dish or the shiny side of aluminum foil and bake for just under 1 hour. 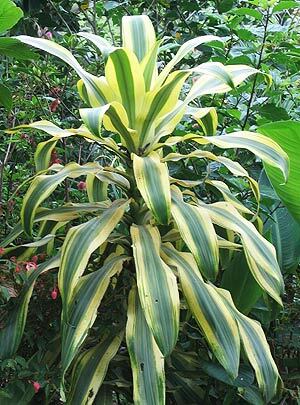 These two plant disorders, diseases and deficiencies, seem to me to be the most serious problems in a tropical garden environment and to the novice they are usually difficult to distinguish. If you are in an area close by a governmental or university agriculture department, make use of their expertise. If you encounter a problem in your garden that you do not understand or cannot identify and treat, call them right away for a consultation. What follows is information on the plant diseases and deficiencies we have encountered in our gardens and the solutions that seemed to work. It is far from a complete list of the problems you may encounter, but we hope you will find the information useful. Chlorosis -- Leaves appear to have splotchy yellowing, that does not follow the leaf veins. This is an indication that the plant is missing one of the minor, but still essential ingredients for its health, probably a mineral. We've had good luck solving this problem by quickly using Miracle Grow in a watered down solution daily for a week or so, but it really is an indication that the soil is inadequate. Using compost and composted manure is a more long term and healthful solution. 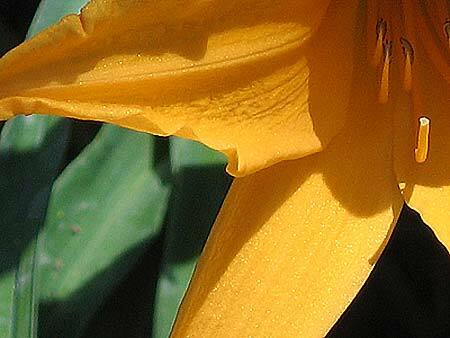 Damping Off -- Almost all gardeners are familiar with this. You plant your seeds in little pots and not long after the tiny green shoots appear, they fall over dead. That is a scenario I experienced in New England. In the Caribbean, our seventy foot long, twelve foot tall hibiscus hedge fell over dead. That puts things quickly in perspective. Powdery Mildew -- This is what you're seeing when the usually hairy leaves of your plants especially squash & cucumbers take on a talcum powder look while the leaves become very papery before turning yellow and dying. It spreads quickly, but if you catch it quickly you'll do just fine. First remove any infected leaves and place them in a closeable plastic bag for disposal. They must not go into your compost pile. Mix 1 cup of milk with 1 gallon of water and spray each and every leaf and plant that has shown the disease. Keep a close eye on the progress plants make in recovery. If it doesn't look good, pull up and dispose of the entire plant. We invested in a small garden sprayer that carries about 2 gallons. It isn't too heavy, but it also holds enough of the treatment all at once to make the whole operation pretty efficient. My poor husband shouldered this sprayer in Montserrat for various reasons. Neighbors told us later they thought we were spraying insecticide, but we never, ever used anything but simple household liquids like milk & soap. 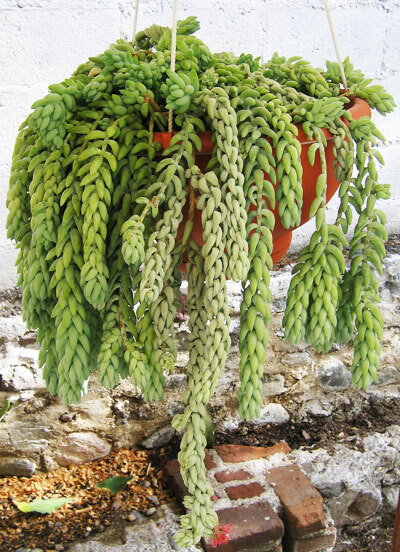 This easy to care for plant is almost a "must have" in Mexico and Guatemala. I absolutely love them. This year I got a great surprise, a blossom. Benefits: They are said to relieve coughs, but I have no idea what part of the plant is used or how it is prepared and administered. It's probably best to talk with your doctor before using any herbal treatment. Photographed: At the Hotel San Buenaventura on Lake Atitlan in Guatemala in May 2010. 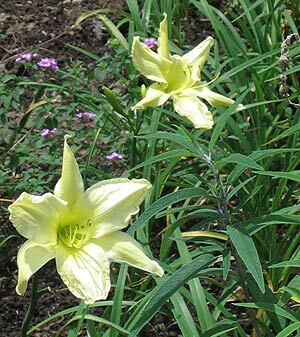 Planting and Care: They are said to prefer full sun, but I have very often seen them growing beautifully in semi shade. Go light on the water to keep them happy and avoid hanging them in strong winds. Text and Photographs ©KO 2010 & GreenGardeningCookingCuring.com 2015/2018. Photographed: In our garden at our home by Lake Atitlan in Guatemala in 2015. 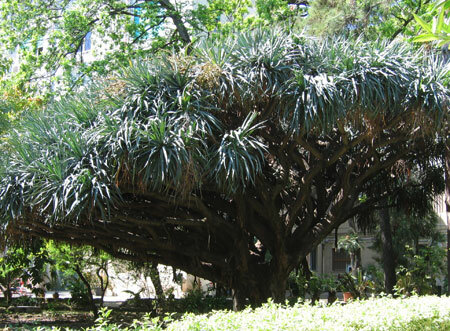 The doung tree grows either like a large bush or a small tree reaching about 40 feet at its highest. 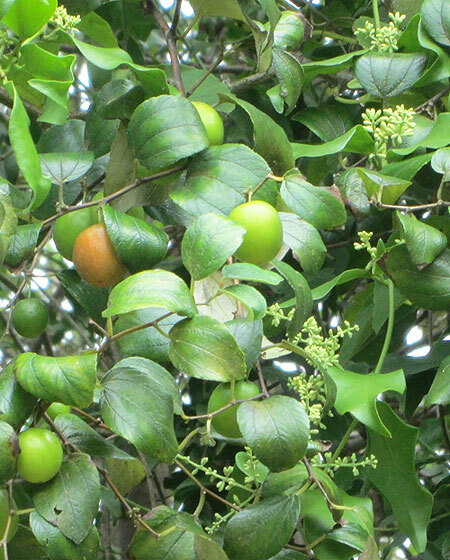 Those near us in Tobago are trees bearing a popular fruit I would say is much like a large plump olive. Benefits: The fruit is plentiful and edible, though best when young. Doung fruits take on a fairly unpleasant taste as they age. Photographed: In Crown Point, Tobago, in 2018. Planting and Care: This is a very tolerant tree growing quickly in either dry or wet conditions. Though it is said to prefer well draining alkaline soils, it will also do well in neutral ground. Oddly enough it does not appreciate higher altitudes, liking it below about 3000 feet. 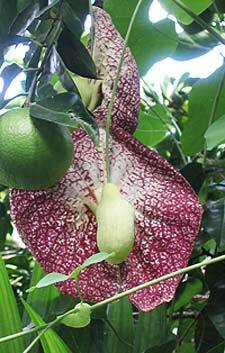 It is not a tree I would recommend for the home gardener because of its tendency to unpleasant tasting fruit. Benefits: This is one of the common household plants that is said to help in clearing indoor air of pollutants like formaldehyde, xylene, and toluene. Planting and Care: The corn plant is tolerant of light level situations, but prefers a semi shady spot with routine rainfall or watering to be at its best. Tolerant of widely varying conditions, it is frequently seen in office environments. Though most familiar as a house or office plant, in the natural environment it will grow to be quite tall and robust. It will even bloom. A popular house plant in colder climates, ours was thriving in Montserrat in the terrace garden when we left for a holiday. When we got back it had died from the extended drought in Montserrat in the spring and summer of 2007. According to a local friend, "It wasn't a drought; it was a barbecue!" We have a new plant and are hoping for a more hospitable weather pattern this year. Photographed: On the left at a neighbor's home in Woodlands, Montserrat and on the right at the Hotel Atitlan on Lake Atitlan in Guatemala. 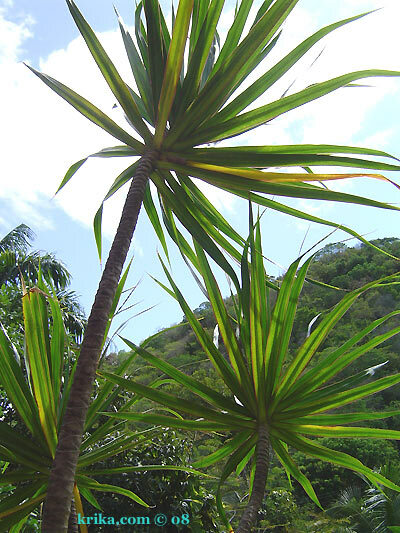 Planting and Care: Although the plant will grow in the hot sunshine of the Caribbean, I think it prefers a place with a little less sun along with routine rainfall or watering. It will grow quite tall, but its appearance can become spindly so think about pruning it every year or so. Stick the cut stems in a watered garden and you will have new plants to find homes for within a few months. This is an extremely appealing tree providing deep shade beneath its umbrella of foliage. I've seen very few of them, but each one seemed to have an enchantment. Benefits: This extremely slow growing tree is said to have medicinal value. From: Canary Islands and Morocco. Planting and Care: I read two very different versions of caring for this tree and I'll give you both, though I think the latter is more likely to give you the tree you'll be looking forward to. 1. This tree will do fine in a bright semi shady area of the garden. Keep in mind it will eventually be a reasonably short, less than 40 feet tall, and very wide tree so give it some space in anticipation. 2. This tree will thrive in full sun all year round. 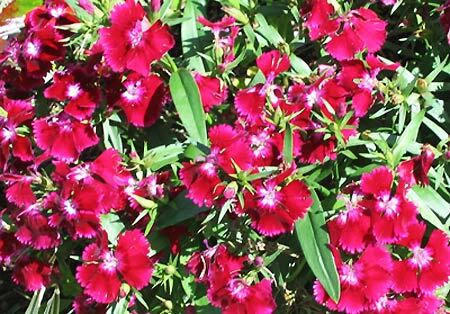 It prefers a rocky, sandy soil with excellent drainage and little in the way of organic material. Think of a hot dry beach area and that's the ideal. Every time I see this plant I immediately think what an incredibly hardy Easter lily. That maybe goes to show how hard it is for me to identify plants, but maybe you'll have the same reaction. 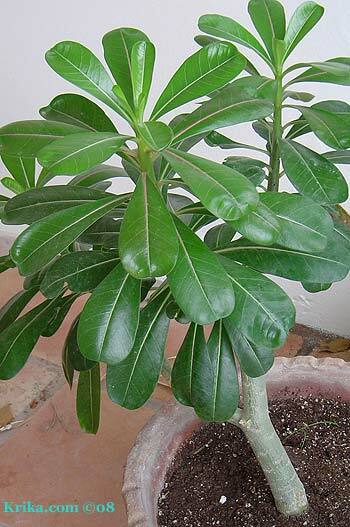 Benefits: One of the best houseplants tested for removing trichloroethylene. 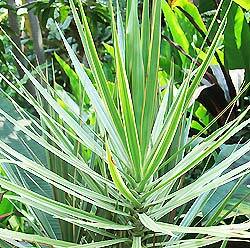 Planting and Care: This is another slow growing member of the family of dracaenas, but like most members it likes bright light, rather than sun, and moist soil to grow well. 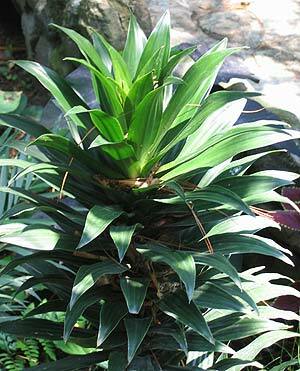 Planting and Care: Bright light or dappled sun and damp, not wet, soil will keep this dracaena growing happily to reach its normal height of between six and ten feet, though it will take its time getting there. Warning: This plant is poisonous for pets. This is the poor plant that had the terrible karma to be introduced to the commercial market as a "lucky bamboo" as part of the feng shui craze. It finds itself growing in a twisted glass bottle and I can't imagine how that would feel. Can you? Benefits: Someone got the feng shui craze going for this poor plant and no doubt they have materially benefited. Planting and Care: This is an easy to care for plant which probably was what sealed its fate with the twisted glass tubes. 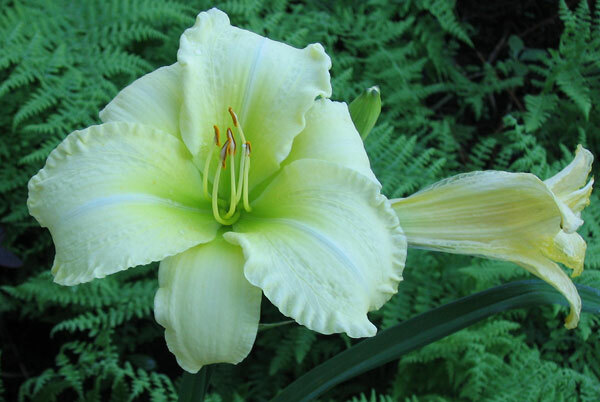 From having one for a few years I think a bright semi shady spot in a garden that receives routine rainfall or watering would suit it perfectly. Benefits: This was and probably still is NASA’s best air purifying plant. Planting and Care: Like other members of this family the Song of India lives just fine in an apartment or home. Put it in a window with bright light and water it when the soil feels dry to the touch. It is not frost tolerant so if you are going to plant it outside it should be warm all year long. Give it dappled sunshine and water when dry and humid air and it will do just fine. I regret to admit that I deemed this perennial plant unattractive from my very early years as an adult with a beautiful already established garden to manage. Along with all of the exuberantly beautiful plants and shrubs, I had dusty miller to look at and tend. In my opinion, if you are already depressed and looking for plant company, you've found a friend in Dusty Miller. Benefits: In Dusty Miller's favor, it is a medicinal plant with proven therapeutic value in the treatment of cataract and corneal opacity. Please see the warning of toxicity below. 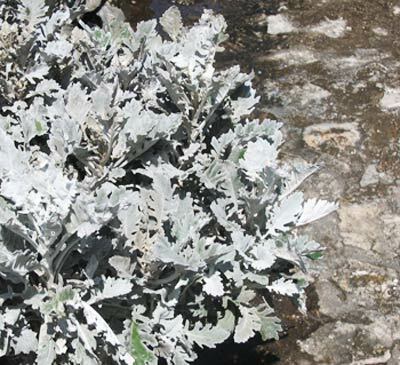 Planting and Care: Dusty Miller is a perennial. 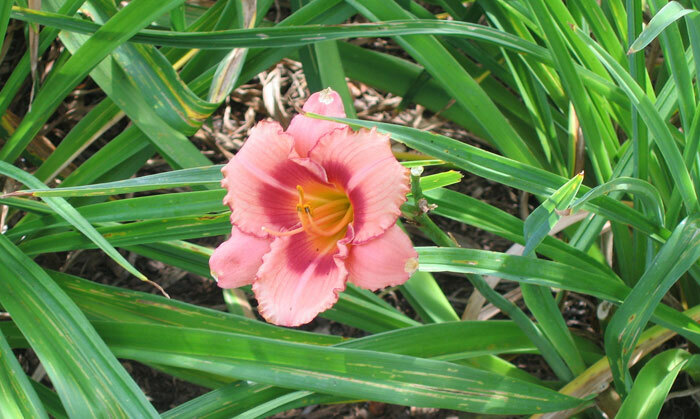 It likes full sun and is not at all fussy about its soil base. Water it regularly until it is settled in and then pretty much let it be. It is very hardy. This very strange plant is a seemingly normal, almost delicate vine, which produces the almost creepy, papery, foot long "flowers" shown below on the right. 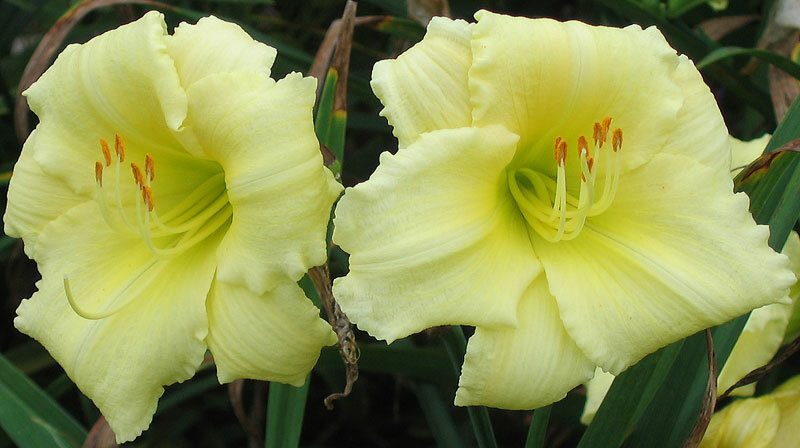 This is the variety that produces the largest flowers and shown on the left and right is a variety with smaller though no less strange flowers. Photographed: In the Botanical Garden at the Hotel Atitlan on Lake Atitlan in Guatemala and in the Winter Garden in Auckland, New Zealand. 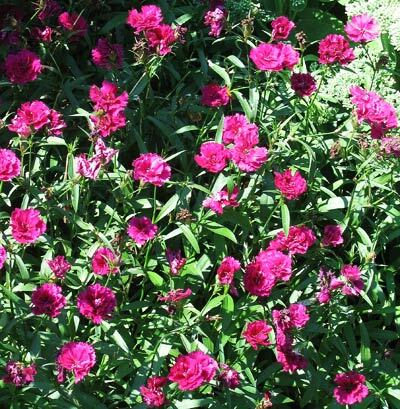 Planting and Care: This is an easy plant to get off the ground and it is a perennial so it is worth paying a little attention in the beginning. 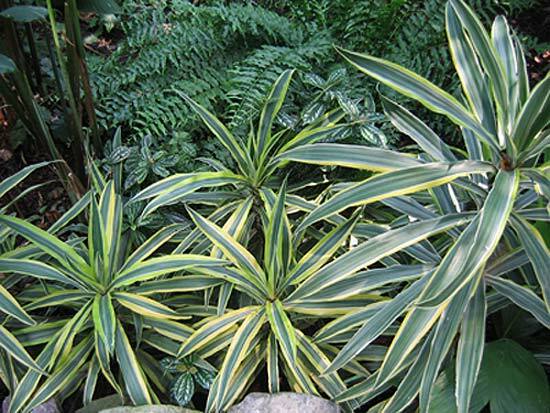 In warm climates it prefers a semi shady location, but any decent soil will do as long as it gets some routine rainfall or watering. What it does need is support so plan to give it a trellis or something similar to grow on. 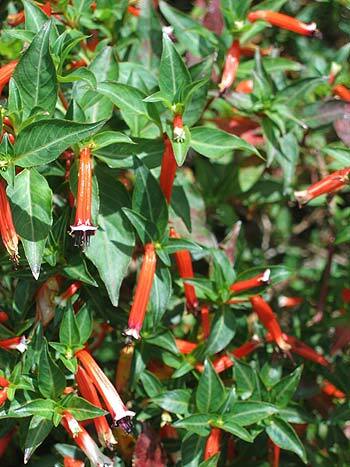 This is a striking shrub because of how its bright red flowers set off the green of its lush foliage. 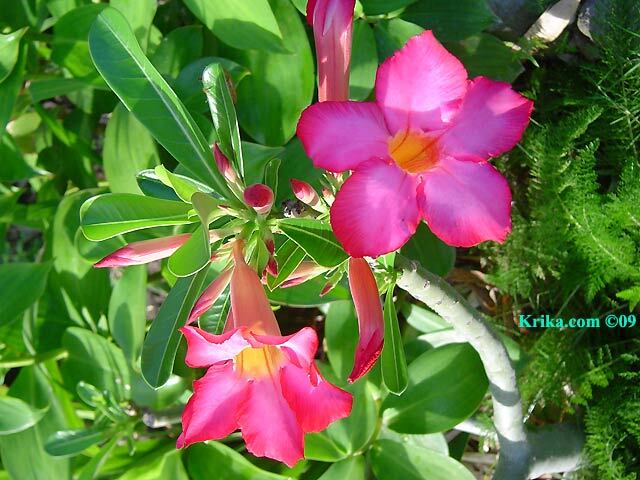 The flowers aren't extraordinary, but the overall effect of the plant certainly is. It makes a nice size shrub growing to be as much as 10 feet tall. Benefits: This plant will attract both butterflies and hummingbirds. Planting and Care: Dwarf mallows like to be in either full sun or bright semi-shade. They don't like heavy winds and so are ideal plantings against a wall or building.